All wording for these invitations can be customized. You will receive an email of only the invitation so you can review all wording before printing and make any changes, etc. Once you approve your cards, your cards will be printed, and inserted into a die cut into diapers, packaged and shipped! These are sold in sets of 8 diaper die cuts which includes your personalization. Our adorable line of baby shower invitations are the perfect way to celebrate the birth of a new baby. Some of our most popular designs include die cut onesie invitations, die cut diaper invitations, baby moose invitation, hip mommy invitations, hot momma invitations, baby stork invitations, blue and brown baby shower invitations, pink and brown baby shower invitations, princess and prince baby shower invitations, ladybug baby shower invitations and many, many more. 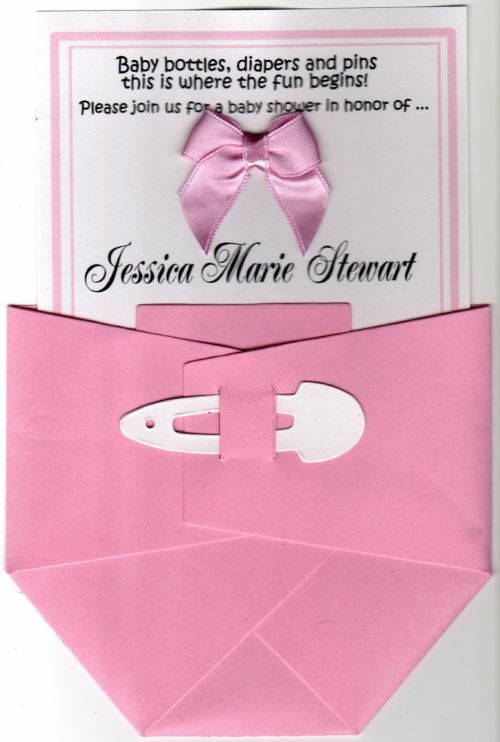 All invitations are custom made and are all made in the USA. Printing is on a laser printer.